The Dream Furniture website is neither intended for nor designed to be used for submission of personally identifiable information by anyone who is less than 18 years of age. We do not collect personally identifiable information from anyone we actually know is a minor under the age of 13. If Dream Furniture becomes aware that any minor is submitting or has submitted personal information to the Site without parental consent, we will close the account and delete any personal information within our control as soon as possible. In addition, for purposes of the Children’s Online Privacy Protection Act (“COPPA”), Dream Furniture makes the following statement: This website is not directed to or intended for persons under the age of 13. If Dream Furniture becomes aware that any person submitting personal information to the Site is under the age of 13, we will close the account and delete any personal information within our control as soon as possible. Certain sections or features of the Site may require you to register. If you register, you agree to provide us with accurate, complete registration information and it is your responsibility to promptly inform us of any changes to that information. You acknowledge that, if any information provided by you is untrue, inaccurate, not current or incomplete, we reserve the right to terminate this Agreement and your use of the Site. As part of the process of creating an account, you will be asked to select a username and password. We may refuse to grant you a username that impersonates someone else, is or may be illegal, is or may be protected by trademark or other proprietary rights law, is vulgar, disrespectful, or otherwise offensive, or may cause confusion, as determined by us in our sole discretion. You will be responsible for the confidentiality and use of your password and agree not to transfer or resell your use of or access to the Site to any third party. You are responsible for taking all reasonable steps and precautions to insure that no unauthorized person will have access to your account or password (if any). If you have reason to believe that your account with us is no longer secure, you must immediately notify us of the problem by e-mailing us at [email protected] YOU ARE ENTIRELY RESPONSIBLE FOR MAINTAINING THE CONFIDENTIALITY OF YOUR PASSWORD AND FOR ANY AND ALL ACTIVITIES THAT ARE CONDUCTED THROUGH YOUR ACCOUNT. The Dream Furniture trade name and Dream Furniture logo are service marks owned by Dream Furniture. All other trademarks, product names and company names or logos displayed on the Site are the property of their respective owners. All text, graphics, user interfaces, visual interfaces, photographs, trademarks, logos, sounds, music, artwork and computer code (collectively, “Content”), including but not limited to the design, structure, selection, coordination, expression, “look and feel” and arrangement of such Content, contained on the website is owned, controlled or licensed by Dream Furniture, or is licensed to Dream Furniture by its respective owners, and is protected by trade dress, copyright, patent and trademark laws, and various other intellectual property rights and unfair competition laws. (4) using any “bot”, spider, site search/retrieval tool or utility, or any other manual or automated technique, to collect, extract, index, mine, or otherwise seek to obtain any data or information from Dream Furniture or any user of the Site, or in any manner compromise, degrade or circumvent the navigational structure or the presentation of the Dream Furniture website, or the display or performance of the Content of the Site; (5) attempting to interfere with, compromise the system integrity or security or decipher any transmissions to or from the servers running the Site; (6) taking any action that imposes, or may impose at our sole discretion an unreasonable or disproportionately large load on our infrastructure; (7) uploading invalid data, viruses, worms, or other software agents through the Site; (8) collecting or harvesting any personally identifiable information from the Site (9) using the Sites for any commercial solicitation purposes; (10) impersonating another person or otherwise misrepresenting your affiliation with a person or entity, conducting fraud, hiding or attempting to hide your identity; (11) interfering with the proper working of the Site; or, (12) bypassing the measures we may use to prevent or restrict access to the Dream Furniture website. We may permanently or temporarily terminate, suspend, or otherwise refuse to permit your access to the Dream Furniture website without notice and liability for any reason, including if in our sole determination you violate any provision of this Agreement, or for no reason. Upon termination for any reason or no reason, you continue to be bound by this Agreement. You further understand and agree that Dream Furniture has the right, but not the obligation, to remove in whole or in part any Content related to the Site, including without limitation all data and Content residing on our servers, at any time for any or no reason, with or without notice and with no liability to us of any kind. Dream Furniture may, from time to time, contain links, to or advertisements for, websites operated by others (each is a “Third Party Site”; collectively, “Third Party Sites”). The links to and advertisements concerning Third Party Sites are provided for your convenience only. We do not control Third Party Sites and are not responsible for any of the content, materials or services contained or provided on any Third Party Site or for performance of any Third Party Site or for your transactions on or with them. Our inclusion of links to or advertisements for any Third Party Site is not, and does not imply, any endorsement of any content, material, product or services offered on or through such Third Party Site, or any association with their operators. We permit you to include on your own website(s) text links to Content on Dream Furniture, provided that: (1) any text ¬only link must clearly be marked “Dream Furniture”; (2) the link must be to the Dream Furniture home page and you do not remove or obscure, by framing or otherwise, any portion of the home page; (3) the appearance, position, and other aspects of the link and host website must not be misleading, fraudulent, or in any other manner damaging to or dilutive of the goodwill associated with our name, trademarks or service marks, as determined by us in our sole and absolute discretion; (4) the appearance, position and other aspects of the link and host website must not create a false appearance that the host website is sponsored by the Dream Furniture; (5) the link, when activated by an internet user, must display Dream Furniture full-screen and not with a “frame” on the linked website; and, (6) you immediately discontinue providing links to Dream Furniture if requested by us. We reserve the right to revoke our consent to the link at any time, in our sole discretion, upon notice to you or by amending this Agreement. When you visit Dream Furniture or send e-mail to us, you are communicating with us electronically. You consent to receive communications from us electronically. Although we may choose to communicate with you by regular mail, we may also choose to communicate with you by e-mail. You agree that all agreements, notices, disclosures and other communications that we provide to you electronically satisfy any legal requirement that such communications be in writing. The receipt of an order number or an e-mail order confirmation does not constitute the acceptance of an order or a confirmation of an offer to sell. Verification of information may be required prior to the acceptance of any order. Prices and availability of products on the Site are subject to change without notice. 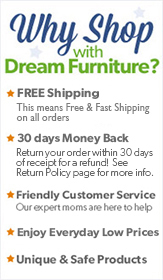 Dream Furniture reserves the right, without prior notification, to limit the order quantity on any item and/or to refuse service to any customer. Errors will be corrected when discovered, and Dream Furniture reserves the right to revoke any stated offer and to correct any errors, inaccuracies, or omissions (including after an order has been submitted). Dream Furniture makes no claim or representation, and accepts no responsibility, regarding the quality, nature, or reliability of the sites accessible by hyperlinks from this Site, or websites linking to this Site. Dream Furniture intends for the information and data contained in the Site or provided via other channels, including but not limited to phone and e-mail, to be accurate and reliable. As the information and data have been compiled from a variety of sources, it is provided “AS IS.” You expressly agree that your use of this site is at your sole risk. Dream Furniture EXPRESSLY DISCLAIMS ALL WARRANTIES AND/OR CONDITIONS, EXPRESS OR IMPLIED, AS TO ANY MATTER WHATSOEVER RELATING TO OR REFERENCED BY THE THIS SITE, INCLUDING, BUT NOT LIMITED TO, THE IMPLIED WARRANTIES AND/OR CONDITIONS OF MERCHANTABILITY OR SATISFACTORY QUALITY AND FITNESS FOR A PARTICULAR PURPOSE AND NON-INFRINGEMENT. DREAM FURNITURE DOES NOT GUARANTEE, REPRESENT OR WARRANT THAT DREAMFURNUTIRE.COM OR ANY OF THE WEBSITE MATERIALS WILL BE FREE OF INFECTION FROM ANY VIRUSES, WORMS, TROJAN HORSES, TRAP DOORS, BACK DOORS, EASTER EGGS, TIME BOMBS, CANCELBOTS OR OTHER CODE OR COMPUTER PROGRAMMING ROUTINES THAT CONTAIN CONTAMINATING OR DESTRUCTIVE PROPERTIES OR THAT ARE INTENDED TO DAMAGE, DETRIMENTALLY INTERFERE WITH, SURREPTITIOUSLY INTERCEPT OR MISAPPROPRIATE ANY SYSTEM, DATA OR PERSONAL INFORMATION. YOU ARE RESPONSIBLE FOR THE IMPLEMENTATION OF SUFFICIENT PROCEDURES, FIREWALLS AND CHECKPOINTS WHICH SATISFY YOUR PARTICULAR REQUIREMENTS FOR SECURITY, ACCURACY, AND DATA INPUT AND OUTPUT, AND FOR MAINTAINING A MEANS EXTERNAL TO DREAM FURNITURE OR THIS SERVER, FOR THE RECONSTRUCTION OF ANY LOST DATA, INCLUDING BUT NOT LIMITED TO ANY DOWNLOADS FROM DREAM FURNITURE OR THIS SERVER. IN NO EVENT SHALL DREAM FURNITURE OR ITS OFFICERS, DIRECTORS, EMPLOYEES, AGENTS, SUCCESSORS, SUBSIDIARIES, DISTRIBUTORS, AFFILIATES OR THIRD PARTIES PROVIDING INFORMATION ON THIS SITE OR VIA OTHER CHANNELS, INCLUDING BUT NOT LIMITED TO PHONE AND E-MAIL, BE LIABLE TO ANY USER OF THE SITE OR ANY OTHER PERSON OR ENTITY FOR ANY DIRECT, INDIRECT, SPECIAL, INCIDENTAL, PUNITIVE, CONSEQUENTIAL OR EXEMPLARY DAMAGES (INCLUDING, BUT NOT LIMITED TO, DAMAGES FOR LOSS OF PROFITS, LOSS OF DATA OR LOSS OF USE) ARISING OUT OF THE USE OR INABILITY TO USE THE SITE OR ANY INFORMATION CONTAINED THEREON, WHETHER BASED UPON WARRANTY, CONTRACT, TORT, OR OTHERWISE, EVEN IF DREAM FURNITURE HAS BEEN ADVISED OF OR SHOULD HAVE KNOWN OF THE POSSIBILITY OF SUCH DAMAGES OR LOSSES. All website design, text, graphics, and the selection and arrangement thereof are Copyright 2011 by Dream Furniture. All rights are reserved or, in the case of product material, all text and graphics are Copyright by the original owner. ALL RIGHTS RESERVED. Permission is granted to copy electronically and to print in hard copy portions of this website for the sole purpose of using this website as an information resource or of ordering goods or services and using this site as a shopping resource. Any other use of materials on this website - including reproduction for purposes other than noted above, modification, distribution, or reproduction - without the prior written permission of Dream Furniture is strictly prohibited. This Agreement is governed by and construed in accordance with the laws of the State of California, United States of America, without regard to its principles of conflicts of law. You agree to submit to the exclusive jurisdiction of any State or Federal court located in the County of Los Angeles, State of California, United States of America, and waive any jurisdictional, venue or inconvenient forum objections to such courts. If any provision of this Agreement is found to be unlawful, void or for any reason unenforceable, then that provision shall be deemed severable from this Agreement and shall not affect the validity and enforceability of any remaining provisions. This is the entire Agreement between us relating to the subject matter herein and supersedes any and all prior or contemporaneous written or oral Agreements between us with respect to such subject matter. Dream Furniture may assign, transfer or delegate this Agreement or any right or obligation or remedy hereunder in its sole discretion. No waiver by either party of any breach or default hereunder shall be deemed to be a waiver of any preceding or subsequent breach or default. Any heading, caption or section title contained in this Agreement is inserted only as a matter of convenience and in no way defines or explains any section or provision hereof, and the singular shall include the plural and the plural the singular.